When you're out shopping for bathroom vanities, you may soon discover that the opulent piece that you picked out may not work in your small space. If space is at a premium, you can take a different tact with your design project by using slender counter space and vessel sinks to open up the available space in your bathroom, according to Better Homes and Gardens. The news source suggests avoiding the typical inlaid sink and storage combination and instead use a single glass counter with two vessel sinks. This will create ample space underneath the sinks to add small baskets, drawers and other slender pieces to provide additional storage. With this counter in place, you can then build around your sinks with bathroom accessories such as soap dishes, toothbrush holders and other small conveniences. 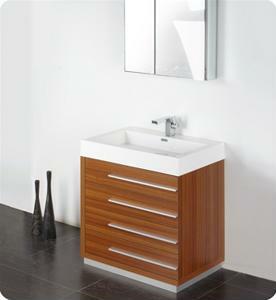 This will give your bathroom unrivaled utility while making your sink area seem like it's not even there! Space-saving is an important staple of many design projects, so using this decorative scheme could drastically improve the look and feel of your bathroom. How do you compensate for a lack of space in your bathroom?